First thing I did months out from the planned upgrade was to set up a stock tank and cycle some water, break in my skimmer, and get the bacteria growing in my biological filter brick. The idea was to do the whole transfer the same day because the new tank was going where the old tank was sitting. I decided to go with the RSR 350 V3 cuz I think the red seas are beautiful tanks and now that the sump has a little space for a fuge, I took the plunge on Cyber Monday. 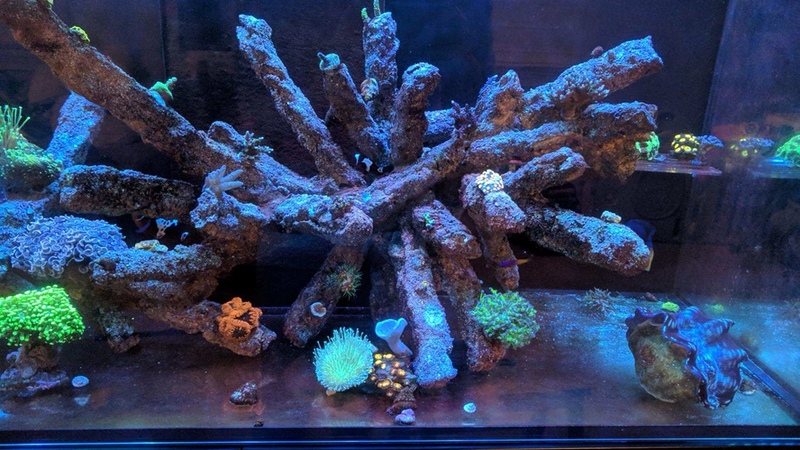 Saltwateraquarium.com had the tank at 7% off plus a free diy screen kit. The new tank got to me in less than 7 days and was very well packed. Assembly was quick and the stand and hardware is very solid. Tank looked awesome but they didn't really take their time making nice clean seams in the sump. 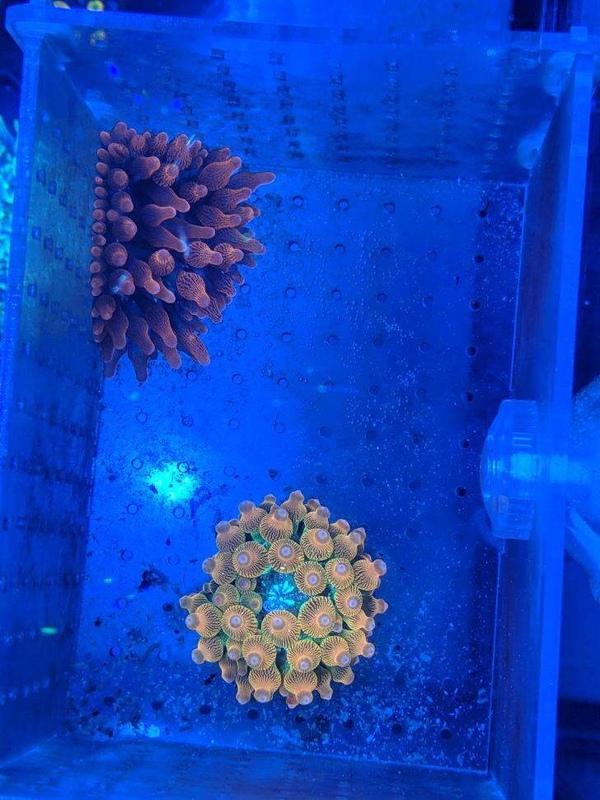 To begin transferring everything, I used a storage bin to hold all the water, coral, rocks and livestock and kept that running with a small powerhead and heater. the container bowed like crazy so I stuck a clamp on it to make me feel better lol. I didn't take any of the substrate from the old tank because i wanted a smaller grain size for this one. I went with 80 pounds of dry Fiji Pink and the rock work is CaribSea's Belize Branch that I cemented together with AF Stone Fix (love this product). I began taking all the water from my stock tank to fill the display and ran a heater to match the old tank's water. The coral in the bin was fragged off the rock, as I was not going to use any of this in the new tank and all the contents of the old tank was put into the sump chamber with a heater as well. I slowly dripped the display tank water into the sump to acclimate the live stock and hooked up just the essential equipment. Once the fish and coral were acclimated for about an hour I started putting them into to the display. This process so far too about 8 hours and I was pretty much wiped out at this point. For the next few days I turned my focus on making a control panel to hide my wires and tidy up the cabinet. I won the sweet new Apex system from the BRS meet so I may as well display it. Stupid me made the mistake of not putting this in before I filled the tank. It would have made screwing in my pocket joint a lot easier. The bottom area is where I'll be putting my dosing container but I haven't figured out the best way to do that yet so until then, my gravel cleaning attachment will hold that up. So today the tank is about 2 weeks old. The fish I brought over from the old tank were a pair of Lighting Maroon Clowns, A firefish, and an old Watchman Goby with his Shrimp pal. I added to that with a large Brisletooth Tomini Tang, Royal Gramma, and a Midas Blenny. I'll be adding some Wrasses when LA finally get the ones I want back in stock. The corals are not starting to encrust and the fish seem happy and eating well. Here are some tank shots as of today. Sorry for the poor photos. I'll try my best to update this thread if anyone wants to follow along. Thanks! It fills in quite nice. A lot of great flow around the sps. Check out Tim190’s tank. He’s got much bigger corals with similar branching rockwork. Here's a few shots of the tank recently. 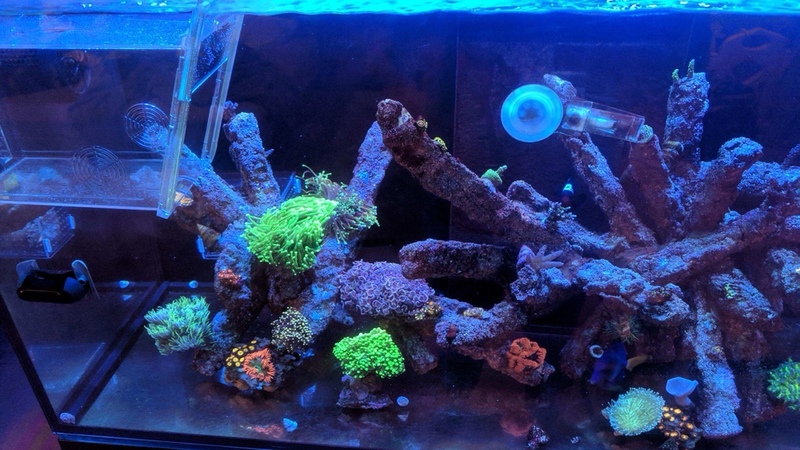 Got a few new Acros in. 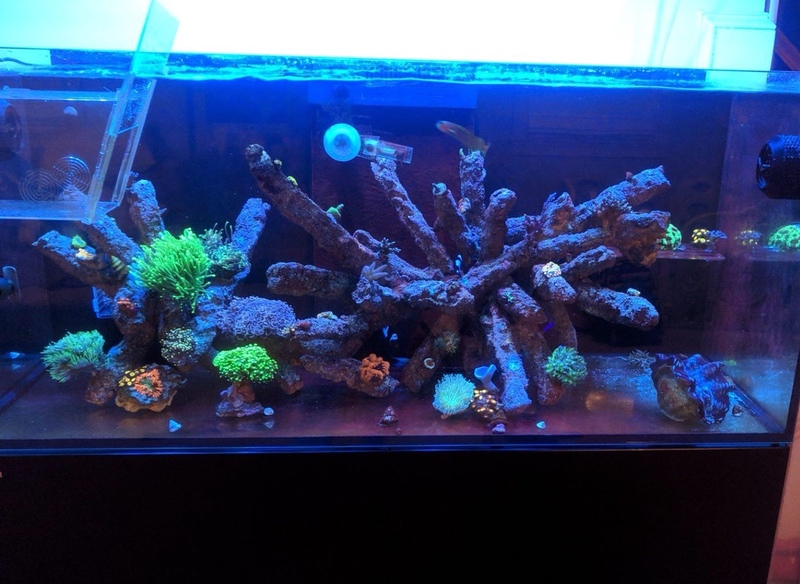 Likes: jah-hoeva and Chris A.
Update: had a little set back...after adding a couple tangs, a Midas Benny and a royal gramma I wasn’t able to keep the sand and tank as clean as I’d like. Also, I think adding the fish in cause another cycle my acros weren’t ready for. Lost a bunch of frags and took out my sand. Since then I’ve gotten some more lps while I wait for the tank to mature some more. They’re starting to look pretty nice. The nems are looking CRAZY right now.. my rainbow nanos which are a lot more orange than your typical rainbow and a new black widow. The striations on these nems are crazy.